Well the dust hasn't settled in the parking lots, but general agreement appears to have been settled upon - it was another great Autumn Weekend here at Cape May; I dread to think just how many photos were taken over the past three days, and just how long it's going to take for all those bird pictures to be catalogued and filed away! As forecast, Saturday turned out to be a pretty dreadful day weather-wise but, to be honest, it could have been worse - we certainly didn't get the foot and a half of snow that some places in North Jersey got! Some localized flooding from astronomically high tides affected the barrier islands and a few roads had to be closed for a while, but somehow our Autumn Weekend kept going. Yes, the boat trips had to be cancelled, but it was impressive the way the weekend participants soldiered on and I particularly liked the way that a variety of impromptu seawatches seemed to spring up anywhere that there was places to stand out of the wind and rain. Also worthy of high commendation was the way that our volunteer leaders turned up in such dreadful conditions, just in case there was anyone wanting a walk - thanks guys! My Saturday was rather strange as it started with me singularly failing to find my waterproofs and having to travel to good old Walmart for another set! But it was well worth as Saturday proved to be a great day for birds. Early morning walks that did go ahead produced an interesting array of sparrows (presumably mostly hangovers from the day before), while the Cape May Point walk produced the bizarre site of a shearwater which did a turn high over the state park before disappearing back out into the bay... At Cape May Airport, shorebirds escaping the flooded coastline included sone 200 or so Black-bellied Plover and a few Dunlin. The seawatch at the Grand Hotel (5th floor, great view!) produced a couple of Common Eider and the season's first Snow Bunting was reported from Brigantine. My own seawatching experience took place at Sunset Beach with my wife and refugees from the rained out Beanery and Meadows walks. We managed three Horned Grebes, two Parasitic Jaegers, four Red-throated Loons, a male Long-tailed Duck, two Bonaparte's Gulls and plenty of Northern Gannets and Royal Terns. At least three Great Blue Herons slowly beat their way back in off the bay against the rain and two American Pipits were feeding on the tideline. Indoor events were understandably popular in such stormy conditions - but surely would have been popular in their own right; Kevin Karlson, Michael O'Brien, Pete Dunne, John Kricher, Ted Floyd, Kenn Kaufman - an amazing team of speakers with a wealth of knowledge, humor and insight to impart. Sunday was certainly a release for us outdoor types as we headed back out for the final day of events. After a day of stormy conditions, birds were hungry and eager to be out feeding. Sparrows were very much the order of the day at most locations and great waves of birds scurried for cover in front of appreciative groups. Kenn Kaufman's group at The Beanery enjoyed a very late Orchard Oriole and the same site also produced Cattle Egret, Golden Eagle, up to three Bald Eagles, two Vesper Sparrows, Yellow-breasted Chat and Tennessee and Black-and-white Warblers. A Yellow-billed Cuckoo was still at Higbee's Beach and at least three Baltimore Orioles, various fly-over Rusty Blackbirds and oodles of both Ruby-crowned and Golden-crowned Kinglets were around - many at amazingly close range. The Rufous Hummingbird at Goshen was joined by a Ruby-throated and the afternoon's Stone Harbor walk produced a Black-throated Green Warbler along with a nice range of shorebirds. A Glossy Ibis at the South Cape May Meadows was followed by reports of a very obliging American Bittern and at least two approachable Vesper Sparrows. Events at the end of the day were to make the meadows the place to be as Kathy and Roger Horn spotted a Black Rail from the viewing platform (Will Kerling had flushed one earlier in the day during a butterfly survey walk at the Plover Ponds which may well have been a different bird). As the masses gathered, all that could be found was a Sora, but those who stayed until dusk were rewarded with a Black Rail calling, along with no less than 21 American Bitterns and two Short-eared Owls leaving the marsh to head south! Boat trips on The Osprey resumed today and highlights from there included the Brown Booby (yes, it really is still here! ), Brown Pelican, Common Loon, Horned Grebe, Bufflehead, Tricolored Heron and a Short-eared Owl. What more can a say? An amazing weekend and, as always, you had to be here to be part of it. Start planning for next year now folks!!! I was busy all day with guided walks today, but in celebration of a great weekend for sparrows, I offer up this Vesper Sparrow, one of two showing well at the South Cape May Meadows. Telling them apart can be tricky, but the sparrows have a subtle charm all of there own and many are really quite beautiful once seen well [photo by Mike Crewe]. Great Cormorants, like this juvenile, sometimes hang out on the jetties in front of the Avalon Seawatch (7th Street in Avalon). Friday was a stunning day at the Avalon Seawatch, with 62,000 scoters tallied (read Tom Reed's report here). Here, a large rush of scoters passes in front of the casinos of Atlantic City as seen from Avalon. Blackpoll Warblers have been moving through in large numbers this October, and have lingered in force through the end of the month. Several were feeding on cedar berries today in Cape May Point State Park. Two Golden Eagles, including this stunner with lots of white in the wings and tail, passed through Cape May today. One headed south over the ocean while the other one drifted off to the north. Numbers of dabbling ducks are high around Cape May Point and the South Cape May Meadows (TNC Migratory Bird Refuge) right now. This Northern Pintail flew past while I was looking for rails and bitterns today. For those taking part in our Autumn Weekend who may not have been present at the meal this evening, please not that, due to the severity of Saturday's forecast, we have deemed it necessary to cancel the mini-pelagic on the Cape May Ferry and the backbay boat trips. If you are signed up for any of these events and need an update, please contact CMBO on the usual numbers. Note also that Kevin Karlson's 12 Noon outdoor photography session has been moved to 1:00PM on Sunday and that a special indoor seawatching event has been set up on the fifth floor of the Grand Hotel - just in case!! All other events are expected to take place as scheduled - and who knows, maybe we will dodge the worst of the weather! Today proved to be a fabulous opening day for the three-day festival with White-winged Dove, Rufous Hummingbird and Clay-colored Sparrow being rarity highlights on a morning that saw a fabulous rush of American Robins, Yellow-rumped Warblers, kinglets and assorted sparrows (including Vesper Sparrow at The Beanery). The Seawatch at Avalon really excelled, finishing with a day total of some 75,000 birds, including 62,000 scoter. 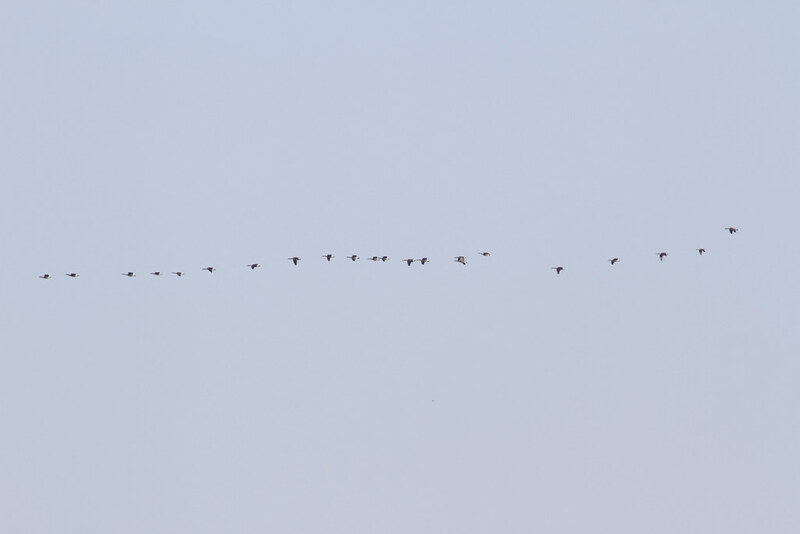 Other highlights there included a high total of 13 American Golden Plovers passing south. At least three American Moorhens were reported today, as well as the first Fox Sparrow I have heard of this season. Palm Warblers were much in evidence at Higbee's Beach this morning, with all but one of those that we saw on our second walk this morning being of the Eastern race (hypochrysea), with an extensive yellow wash on the underparts [photo by Mike Crewe]. Our 'flying things other than birds' walk proved almost a complete luck-out due to the cool and overcast conditions, but was redeemed in spectacular fashion by the discovery of a very obliging Black Witch right at the start - what an awesome place this is!! Black Witch (Ascalapha odorata) at Cape May Point State Park this afternoon. This species is a large tropical moth with a wingspan of up to six inches (that's longer than a Palm Warbler!) and is the largest owlet moth in North America. Despite its tropical distribution, it is prone to vagrancy and has been recorded from all 50 US states and Canada. It is overall most rare in the north-east however, and this is probably the first Cape May record for a number of years. The narrow, pale pink band on this individual indicates that it is a female [photo by Mike Crewe]. Tomorrow's forecast doesn't bode well for a day spent out in the field but remember, forecasts can be - and often are - wrong. Our guides will be out there, we look forward to seeing you. Fingers crossed!! It was a funny old day today and one where you either hit the right place - or you didn't. The Morning Flight count at Higbee Dike seemed to be a bit so-so by all accounts, leaving Tom Johnson with time to head out to the backbays on a very full high tide and report good numbers of salt sparrows (ie Seaside/ Saltmarsh/ Nelson's - delete as necessary!). Tom sadly also found a dead Northern Saw-whet Owl on Avalon Boulevard, presumably hit by a car during the night. A couple of recent reports of fly-by Short-eared Owls suggest that owl time is upon us. In contrast to the dike count, my walk at Hidden Valley this morning scored an amazing total of 90 Eastern Meadowlarks, with a biggest single-flock count of 48. This is far and away the biggest count I have had of this rapidly declining species in Cape May over the last couple of years and more reminiscent of the 'good old days' when there was more grassland in the eastern US. American Coots continue to increase at the point with probably over 200 now, scattered around the state park and meadows ponds. This is a good number for here, but what does it suggest? A good breeding season, or sign of bad weather further north? American Wigeon and Gadwall flying off Bunker Pond. Checking the axillaries in the 'armpits' of the wigeon is a good way to look for Eurasian Wigeon - which has gray not white axillaries. 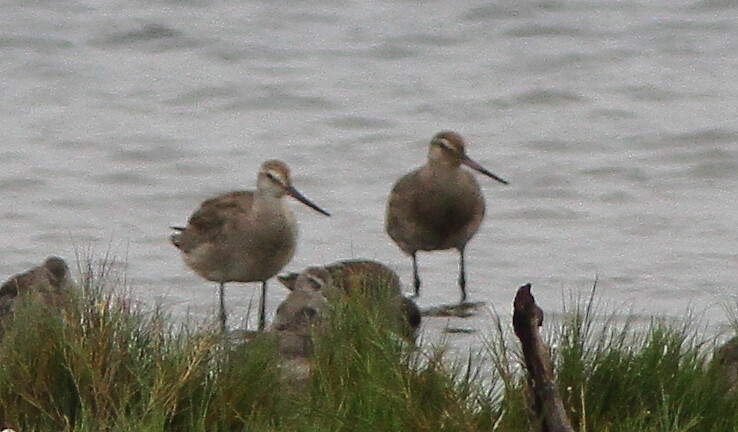 Michael O'Brien reported four Long-billed Dowitchers from the South Cape May Meadows yesterday and they were still there today (one of them is off to the left and wouldn't fit in the photo!). Long-bills tend to favor freshwater ponds over tidal saltflats and are far less common here in Cape May than Short-bills. Tern numbers have dwindled considerably since the heady days of August and early September, but there's still a few hundred Forster's Terns out there with their little black 'bandit masks'. Note the gray-winged Common Tern at the top - there was still two of these hanging out on the beach today. It had these strange white patches on both sides of its face! That's one way to stand out in the crowd I guess!! Elsewhere today, there's been reports on and off lately of a Selasphorus hummingbird at our Goshen Center and Vince Elia reports that it is still present as I write. We assume this is either an Allen's or a Rufous, or maybe even a Broad-tailed Hummer. Juveniles of these three are notoriously difficult to identify and an out-of-range bird often even more so. The Seawatch continues to turn up interesting counts daily now, with today producing 80 Purple Sandpipers last time I heard, while some nice counts of Wood Ducks passing offshore with scoter are always interesting to ponder on - perhaps they've learnt that it's better than being shot!! STOP PRESS - Before I even finish the post, I hear that the hummingbird at Goshen is identifiable as a Rufous Hummingbird. A nice bonus for the Autumn Weekend Birding Festival if it hangs around! It's always nice to get pictures from our many visitors, who always seem to leave Cape May with sand in their shoes - which means they will return some day. Here's a few I received recently. 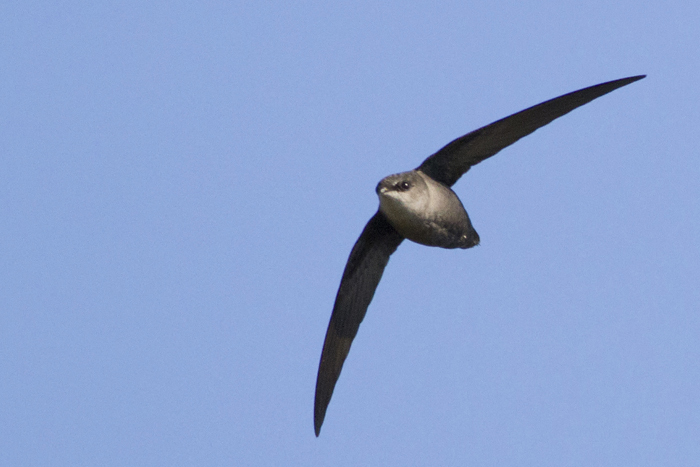 Sam Galick sent me this truly amazing picture of a Chimney Swift and we present it here in celebration of an amazing day on Saturday when more than 500 of these 'flying cigars' were tallied passing through Cape May Point. A remarkable event so late in the season. 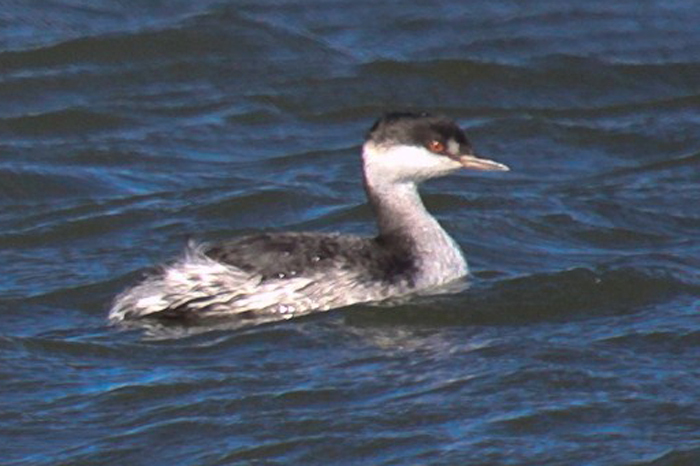 Horned Grebes like to hang out in the main channels and are not always that approachable, so Mike Newlon did a nice job getting a photo of this guy from The Osprey last week. Wildwood resident Dave Fleming snapped this wonderfully moody shot of 23 Brown Pelicans with his phone while on the seafront. It's been a great autumn here for this species with good numbers passing in late September and early October. We finish with three pictures from David and Susan Disher from North Carolina. Warblers may be subtly less colorful in the Fall than they are in Spring but you sure can see them better this time of year! 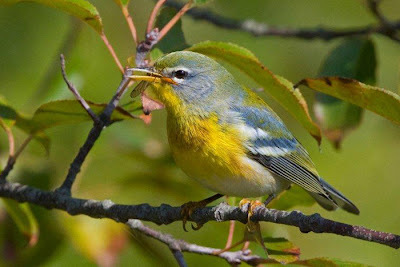 Here are fine portraits of Northern Parula, Yellow Warbler and Prairie Warbler. The last two are pretty much done heading through here now so these are nice finds (the Prairie Warbler was seen October 17th and the Yellow Warbler on 18th). Excitement builds as we head towards this year's Autumn Weekend Birding Festival and there is still plenty of birds to see - with a very promising forecast for the weekend itself! The Hawkwatch Platform was aglow with excitement when I stopped by a short while ago, as a dark morph Swainson's Hawk had been showing itself spectacularly well to the gathered admirers. A steady stream - yes a stream! - of Northern Harriers was breezing through, along with an even greater number of American Kestrels and Merlins. Bald Eagles? Yeah, they were there, you know, you see them every day now!!! 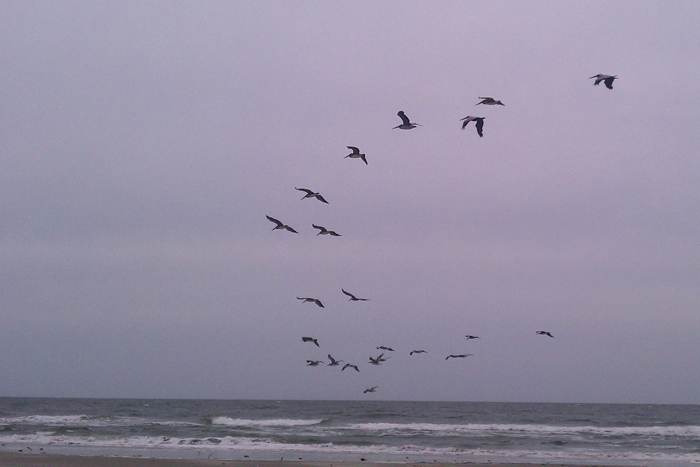 Higbee's Beach was certainly alive with birds today (see, I told you to get down here! ), with Tom Johnson recording some 15,000 Yellow-rumped Warblers on the Morning Flight Project at Higbee Dike, as well as an impressive show of other birds, including Blackpoll Warblers, American Robins and the first notable passage of Hermit Thrushes for the season. Yesterday's dark morph Swainson's Hawk arose early from somewhere in the Hidden Valley area and headed out early - though not before making a pass at the Hawkwatch Platform. As for the fields at Higbee's... Well it took us some time just to walk the last few yards of road to get into the fields in the first place, as wave after wave of Yellow-rumped Warblers, Ruby-crowned Kinglets and White-throated Sparrows poured across in front of us. Eastern Towhees were calling in impressive numbers from deep in cover and good numbers of Chipping Sparrows and American Robins were present too. We spotted a Swainson's Thrush high in a Virginia Creeper, then shortly after we were distracted by little parties of Palm Warblers (mostly the yellower Eastern form) and a smart Blue-headed Vireo. We didn't get as far as we had intended, but we didn't need to, for the birds came to us! One little corner of Porcelainberry harbored eight Hermit Thrushes, as well as several Gray Catbirds and Brown Thrashers and single Yellow-billed Cuckoo, Magnolia Warbler, Yellow-breasted Chat and Lincoln's Sparrow. Further on, we came across a second Yellow-billed Cuckoo and heard about a second Yellow-breasted Chat, while kinglets and warblers continued to entertain the gathered admirers. A heavy wave of sparrows this morning made up for a shortage of these birds over the past week or so. This Lincoln's Sparrow was our prize find amongst the hordes of White-throated, Song, Swamp, Field, Chipping and Savannah Sparrows [photo by Mike Crewe]. ...but this Blackpoll Warbler just posed so nicely in the Porcelainberry [photos by Mike Crewe]. Our garden came up trumps again before work this morning with a nice range of birds, including this Nashville Warbler [photo by Mike Crewe]. I had to drop by the Rea Farm on the way to the office and chanced across another Nashville Warbler that Mike Fritz had just spotted and I did note the odd Swamp and Savannah Sparrow there too. Down at the Hawkwatch, they seemed to have a heck of a day today, with Merlins and American Kestrels roaring past at point blank range, Sharp-shinned Hawks spiralling way up high and an impressive run of Bald Eagles. When I was there at lunchtime, seven Bald Eagles were in view together - even the diehards were impressed!! A little after 2PM, we were all alerted to a dark morph Swainson's Hawk by Michael O'Brien - heading over his house of course! The bird soon came into view from the Hawkwatch and then made an impressive low fly-by at the Northwood Center. That's my kind of bird! 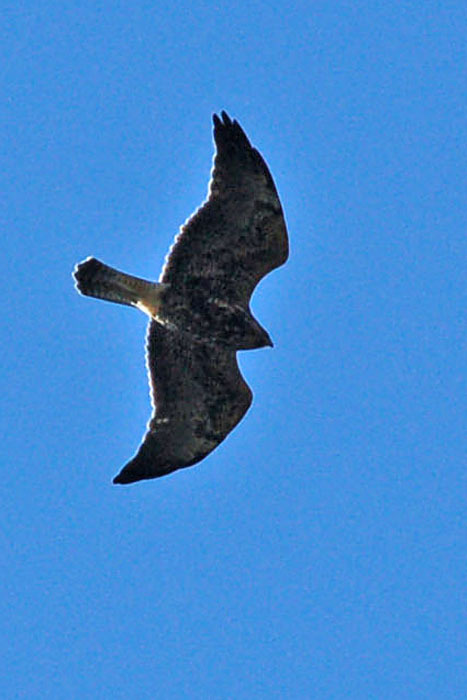 Swainson's Hawk over Stevens Street [photo by Clay Sutton]. Also notable today was the impressive passage of Chimney Swifts, given the late time of year. I saw at least 15 during the course of the day and I am sure that those who spent more time out there will have notched up a higher number than that. Tom Reed recorded the first Purple Sandpiper of the season at the Avalon Seawatch and a smattering of shorebirds passed through the point, with Pectoral Sandpipers making it into double figures. The two female-type Eurasian Wigeons continue on the state park ponds. If you can't make this weekend, I'll see you next weekend - because it's our Autumn Weekend Festival with all the fun and great birding that is always associated with that event and I can't believe anyone would want to miss it!! And if you are in the area, we have just two places left on Louise Zemaitis's awesome, three-day 'Cape May With Everything On It' workshop - the very best way to be treated to the cream of North American birding in Fall! Due to a postponement last weekend, our Great Egg Harbor River Cruise is rescheduled for this coming Saturday, October 22nd. Because of the date change, we have a few places left so, if you fancy a great day out on the river looking for raptors and waterbirds and enjoying some fabulous South Jersey scenery, jump in quick and grab yourself a place! Contact Chris Tonkinson at 609-861-0700 to book or for more details. I look forward to seeing you there!! Now and again - honestly, it's only now and again! - I complain just a little about being stuck in the office while the world and his wife appear to be out and about and enjoying all the great birds that Cape May has to offer. Well, today I think I probably lost any sympathy that my whining may attract, since the Northwood Center seemed to have great luck stowed upon it - and most specifically, my office window!! The day had started well with a Connecticut Warbler, two Cape May Warblers and two Blue-headed Vireos in our yard, along with a good assortment of other birds - but there was work to be done in the office. Settling down to a plethora of emails my attention was drawn to a small group of shrubby trees just outside my window - the distraction had begun! A Sassafras, a small American Holly and a barely-worthy-of-the-name-'tree' Hackberry were attracting birds with, at one point, seven birds present and all of different species! This continued throughout the day, but the skies above produced the goods too. As shapes began to circle overhead, it soon became apparent that a good raptor flight was taking place and it wasn't long before a text message from Doug Gochfeld had me dashing out the door and trailing customers along with me. A Golden Eagle had been seen from the Hawkwatch - chances are it might come our way. Well, it took a few minutes, but the eagle duly appeared; in fact, it appeared alongside a juvenile Bald Eagle and mixed in with a wonderful mix of other raptors. At one point it was mobbed by a young Northern Harrier while seemingly endless numbers of Cooper's and Sharp-shinned Hawks spun past, accompanied by Black and Turkey Vultures, Peregrines and Red-tailed and Broad-winged Hawks. And what of the birds from the window? Well here's a few shots I got today. Oh yes, didn't I mention it? I keep a 400mm lens on the desk - just in case!! Not the sharpest of shots, but they do like the darkest of spots! This Brown Creeper checked out the holly trunk for a few minutes and gave me a chance to appreciate just how frosty they are compared with European Treecreepers [photo by Mike Crewe]. Third of the day! This snazzy Blue-headed Vireo chose the holly to spend its time and knocked off several small moths in the late afternoon [photo by Mike Crewe]. Well, that's just a few of the birds that paraded before me today and made all that paperwork that little bit more bearable! Elsewhere over the past couple of days, birds have continued to trickle through nicely, despite the variable and often windy weather. Some interesting reports from backyards in the county have included Mourning Warbler, Scarlet Tanager and Orange-crowned Warbler as well as an as-yet-unidentifed-to-species Selasphorus hummingbird. Two American Avocets continue on the mudflats near Nummy's Island, mostly being reported from near the toll bridge at the south end of the island. An Ash-throated Flycatcher reported from Cox Hall Creek WMA yesterday was still present today. At the Seawatch, Tom Reed reported his first of season Horned Grebe on 16th as well as a nice surprise in the shape of a Red-headed Woodpecker. Horned Grebes and Common Loons featured on both The Skimmer and The Osprey boat trips during their journeys out to see the Brown Booby - which seems to be getting on like a house on fire with the local Double-crested Cormorants now! Common Loon from The Skimmer [photo by Ginny Powell]. Cattle Egrets are pretty uncommon at Cape May this time of year so it's surprising that this bird went almost unreported, despite spending several days in the area (here seen flying across the state park parking lot on October 12th [photo by Mike Crewe]. Sharp eyes may have spotted that reed spraying hasn't taken place at The Meadows or the state park yet this Fall. The weather has been too windy for the past couple of weeks, but the last I heard was that they were going to try again this week. Both sites are likely to remain open now that the spraying is more localized, but please do be prepared to take on-site directions from staff if spraying is in progress during your visit. This is the NEW! 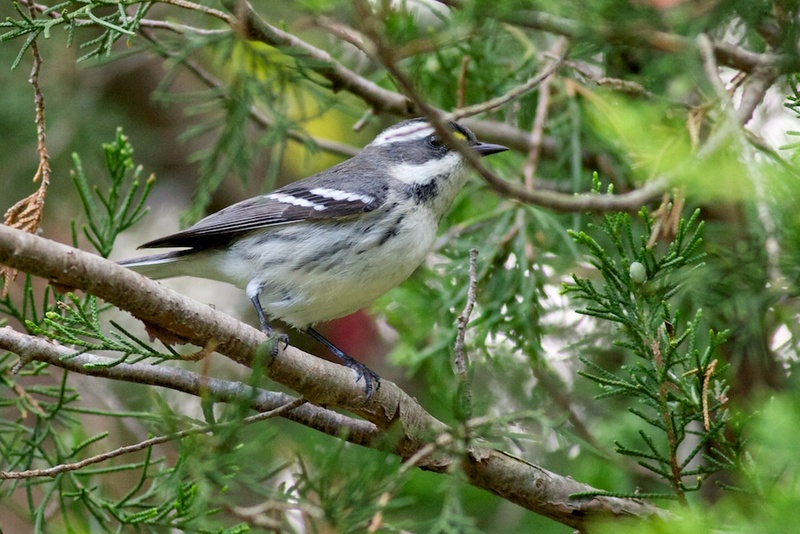 Cape May Birding Hotline, a service of New Jersey Audubon Society's Cape May Bird Observatory. From now on we'll be integrating photos, eBird checklists, and audio recordings of birds around Cape May, Cumberland and Atlantic Counties. This week's message was prepared on Thursday, October 13th, 2011. Highlights this week include sightings of AMERICAN AVOCET, AMERICAN BITTERN, AMERICAN GOLDEN-PLOVER, AMERICAN WHITE PELICAN, AMERICAN WIGEON, BAY-BREASTED WARBLER, BLACK SKIMMER, BLACK-BELLIED PLOVER, BROWN PELICAN, CACKLING GOOSE, CANADA GOOSE, CAPE MAY WARBLER, CASPIAN TERN, CATTLE EGRET, CLAY-COLORED SPARROW, COMMON EIDER, COMMON YELLOWTHROAT, GREAT SHEARWATER, CORY'S SHEARWATER, DOUBLE-CRESTED CORMORANT, EURASIAN WIGEON, GOLDEN EAGLE, GREEN-WINGED TEAL, HUDSONIAN GODWIT, LAUGHING GULL, LESSER BLACK-BACKED GULL, LINCOLN'S SPARROW, LONG-BILLED DOWITCHER, LONG-EARED OWL, MARBLED GODWIT, NELSON'S SPARROW, ORANGE-CROWNED WARBLER, PARASITIC JAEGER, PIED-BILLED GREBE, PINE SISKIN, POMARINE JAEGER, PURPLE FINCH, RED KNOT, RED-BREASTED NUTHATCH, REDHEAD, RED-HEADED WOODPECKER, RED-WINGED BLACKBIRD, RING-NECKED DUCK, RUDDY DUCK, SEASIDE SPARROW, UPLAND SANDPIPER, VESPER SPARROW, VIRGINIA RAIL, WESTERN SANDPIPER, "WESTERN" WILLET, WILSON'S SNIPE, YELLOW-HEADED BLACKBIRD. We'll be breaking the RBA down by day, and county. Here we go! 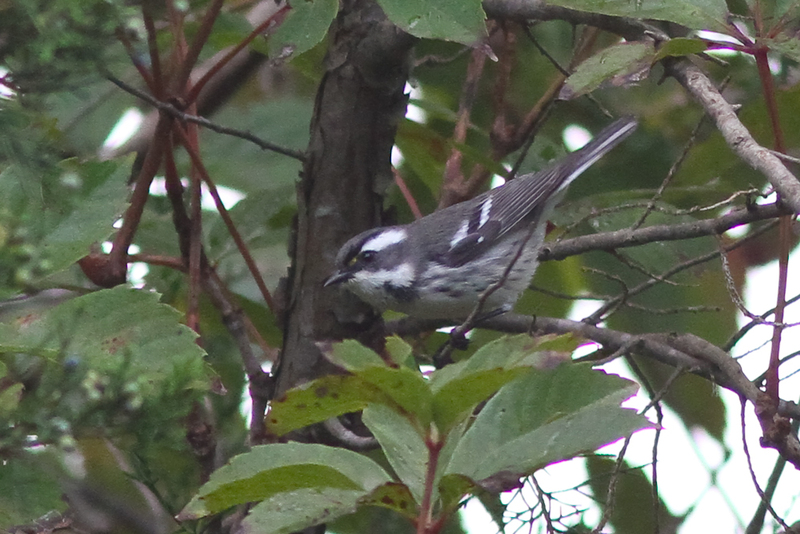 The only photo to surface of the Oct. 3rd BLACK-THROATED GRAY WARBLER found at the North end of Davies Lake- Higbees Beach WMA seems to show a different individual from the first BLACK-THROATED GRAY WARBLER (1) (2) at Higbees Beach WMA on Sep. 29th. An unusually confiding late UPLAND SANDPIPER (1) (2) has been seen off and on for a week; the last day it was reported was Oct. 6th. A LONG-EARED OWL was recorded flying around Cape May Point. Highlights from the dike at Higbees Beach WMA included AMERICAN GOLDEN PLOVER (1), and AMERICAN WHITE PELICAN (1) (2) (eBird Checklist). The first RING-NECKED DUCK of the season was a drake seen on Lighthouse Pond at Cape May Point State Park in the afternoon. Highlights from the Avalon Seawatch included COMMON EIDER (1), and REDHEAD (eBird Checklist). RED-BREASTED NUTHATCHES and PINE SISKINS were noted at Cape May Point. A leucistic LAUGHING GULL has been seen around Cape May off and on for the past couple of months. 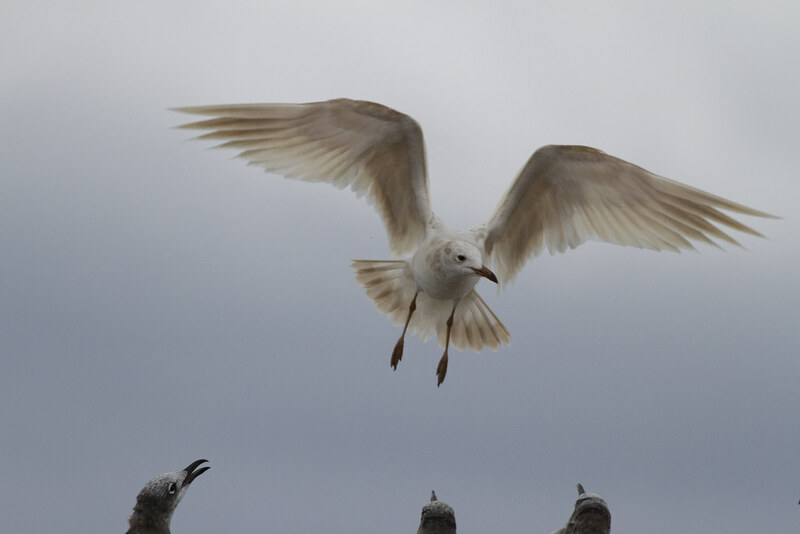 Please be on the look out for this bird, careful observation should be taken with any "white-winged" gulls- even careful observers have mistaken this bird as a poor look at a distant Iceland Gull. The BROWN BOOBY seen nearly everyday since August 20th was seen again in Jarvis Sound on board the Osprey (eBird Checklist). 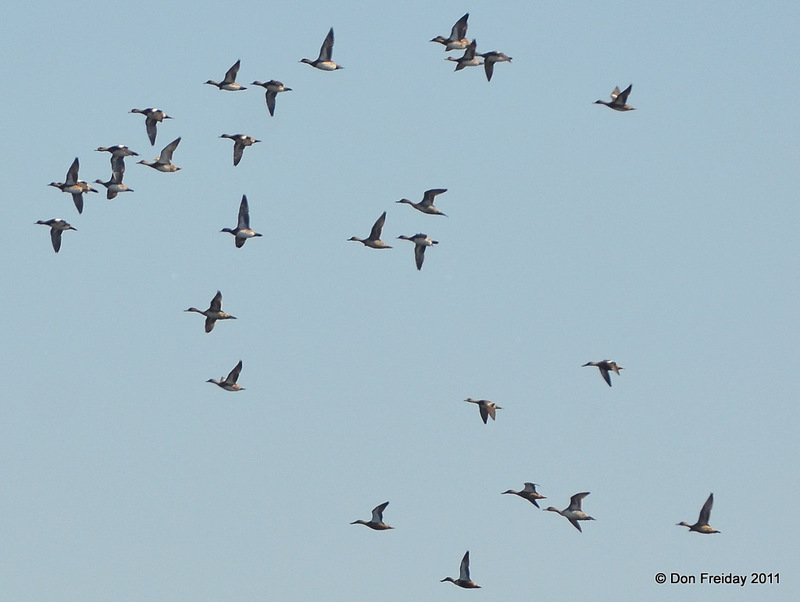 The Avalon Seawatch had a small push of 27 BROWN PELICANS and three COMMON EIDERS (eBird Checklist). Team EXIT HERO (team/bird photos (1) (2) (3) (4) (5) (6) (7) (8) (9) (10) (11) (12) (13) (14) (15) (16) (17) (18) (19) (20) ) conducted it's Big Sit organized by Birdwatcher's Digest on the hawkwatch platform at Cape May Point State Park. The count was covered for a full 24 hours for the first time. 117 species were tallied with highlights of two EURASIAN COLLARED-DOVES flying by the lighthouse and a CACKLING GOOSE (1) in a CANADA GOOSE flock that later landed at Lily Lake and the Beanery. News came in later of a female EURASIAN WIGEON (1) was amongst the AMERICAN WIGEONS at Lighthouse Pond. It was never seen from the hawkwatch platform nor counted on the Big Sit despite large waterfowl groups moving in and out of Bunker Pond all day. A juv. RED-HEADED WOODPECKER was a highlight during a trip to the Villas WMA (eBird Checklist). 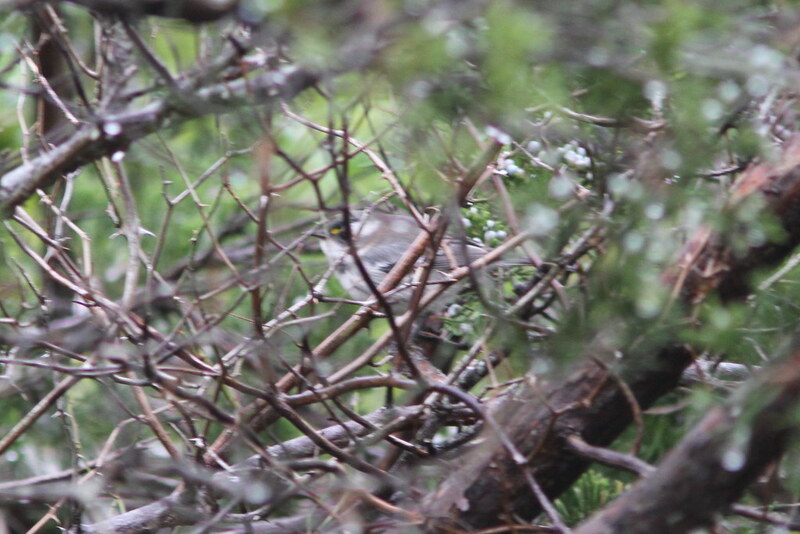 A CLAY-COLORED SPARROW was seen at the Beanery (eBird Checklist). A CATTLE EGRET was seen at the Shunpike pond. Almost 3,000 DOUBLE-CRESTED CORMORANTS, 31 BROWN PELICANS, three PARASITIC JAEGERS were tallied at the Avalon Seawatch (eBird Checklist). The new local group of EURASIAN COLLARED-DOVES have grown from three to four birds, seen flying by the Coral Ave. dune crossing at Cape May Point (eBird Checklist). 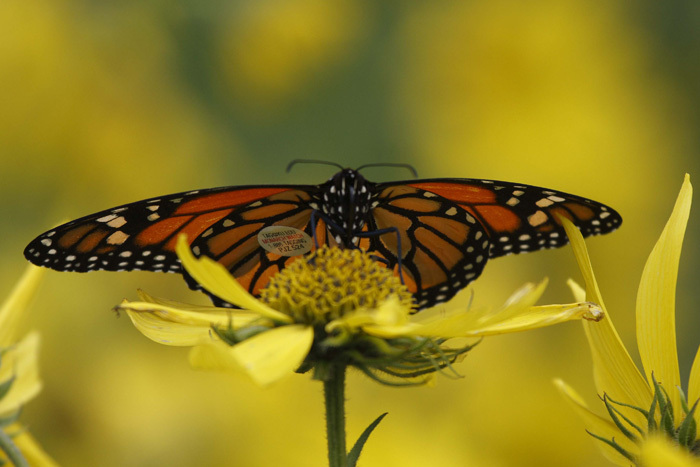 If they decide to live here through the winter, New Jersey could have it's first breeding record of this rapidly expanding species next year. The season's first GOLDEN EAGLE (juv.) of the fall was first found on Steven's Street and later counted at the hawkwatch platform (eBird Checklist). A Morning Flight update on the Seasonal Research tab of birdcapemay.org has a good photo update on what's been flying by including a couple good tips on BAY-BREASTED WARBLER identification. 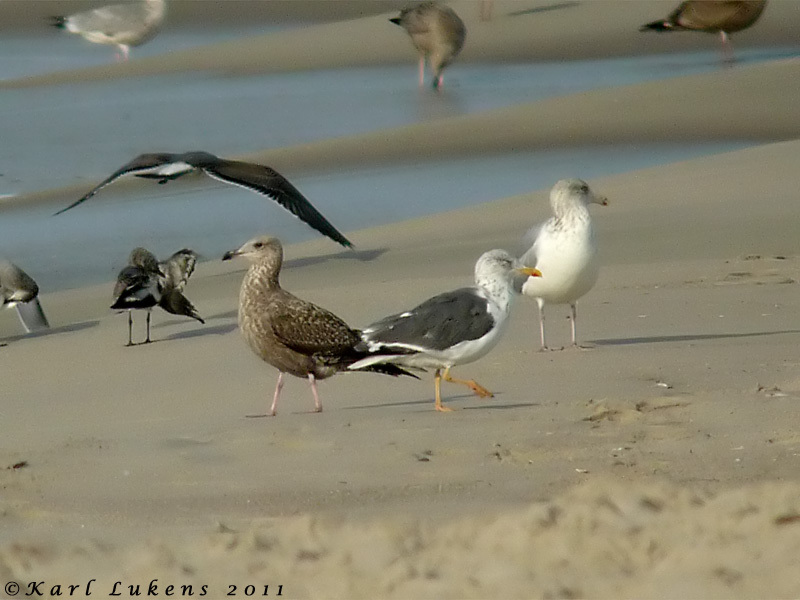 An adult LESSER BLACK-BACKED GULL was photographed at the Cape May Meadows. A PURPLE FINCH was seen briefly along New England Road. The Avalon Seawatch continued it's streak of 24 BROWN PELICANS winging-it South (eBird Checklist). The four EURASIAN COLLARED-DOVES are still flying past Coral Ave. dune crossing in the morning at Cape May Point; closer observation showed that at least three had retained old outer primaries (eBird Checklist). A Stone Harbor Point trip was highlighted with two AMERICAN AVOCETS at the base of toll bridge on bay side (eBird Checklist). A private pelagic trip tallied three CORY'S SHEARWATERS, seven GREAT SHEARWATERS and a POMARINE JAEGER, along with some interesting landbirds- A CAPE MAY WARBLER and three PURPLE FINCHES (eBird Checklist). 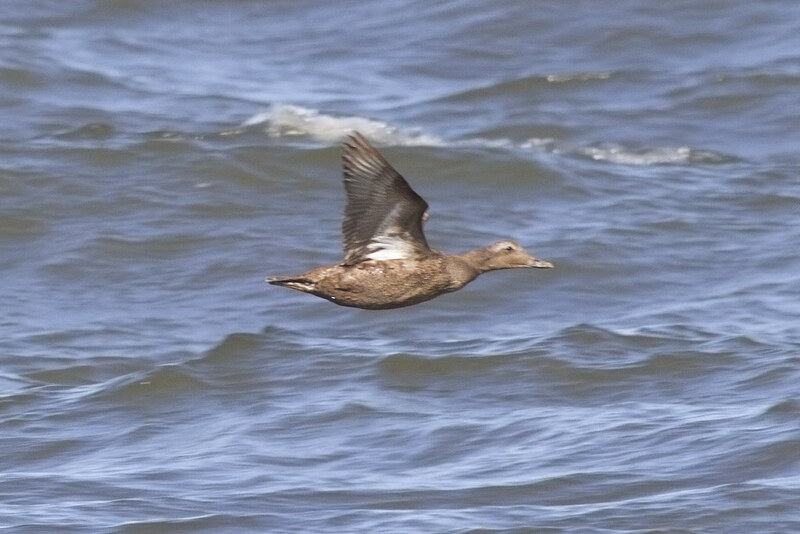 And yet another photo update on birdcapemay.org.The Avalon Seawatch was in full gear with the first day of multi-thousand count of scoters flying past with a couple hundred GREEN-WINGED TEAL mixed in. 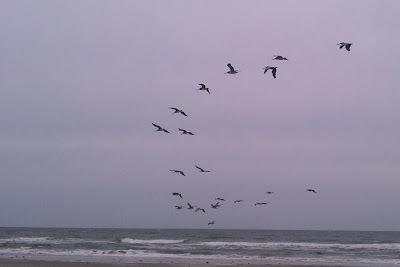 With 33 more BROWN PELICANS the Seawatch's total for 2011 passes 200 (eBird Checklist). 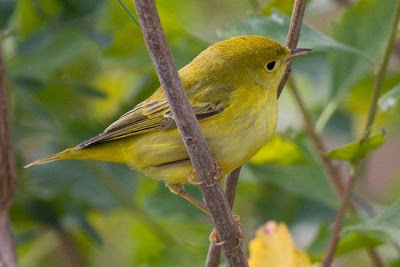 Cedars next to the hawkwatch had 14 species of warblers including an ORANGE-CROWNED WARBLER (CMBO Blogpost). Two EURASIAN WIGEONS were at Lighthouse Pond with a NELSON'S SPARROW seen along the boardwalk there. Another Ammodramus- this time a SEASIDE SPARROW, rarely seen outside of a saltmarsh, was found at the South end of Lily Lake. The probable same CATTLE EGRET found on the 9th was seen at the Cape May Meadows along with a WILSON'S SNIPE and a calling VIRGINIA RAIL. The Avalon Seawatch continues to put on a good show with all three scoters represented (CMBO Blogpost). The popular CATTLE EGRET was seen on the railing in Bunker Pond at Cape May Point State Park. A VESPER SPARROW was seen on the East path of the Cape May Meadows along with an AMERICAN BITTERN. Around 60 "WESTERN" WILLETS were seen at Nummy's Island (eBird Checklist). 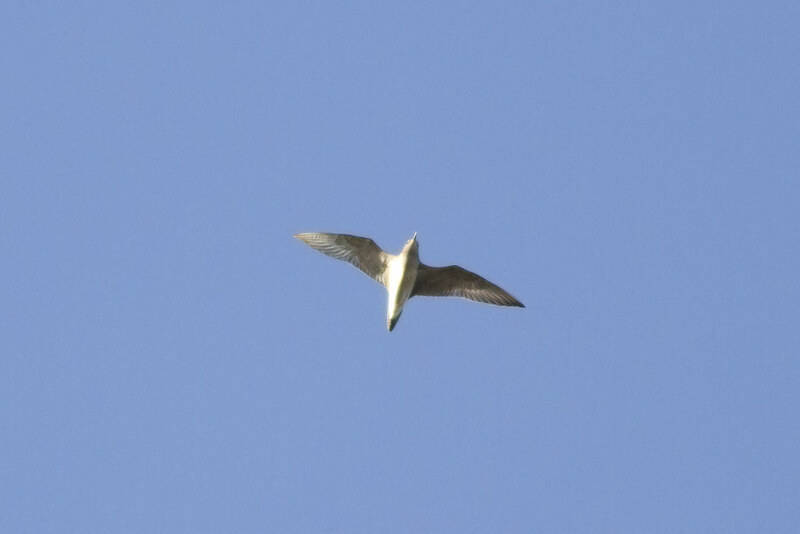 PARASITIC JAEGERS are increasing daily at the Avalon Seawatch (CMBO Blogpost). 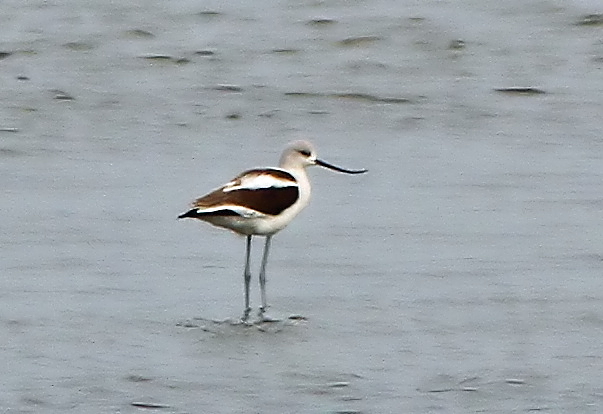 An AMERICAN AVOCET (1) and a juv. GOLDEN EAGLE was seen at Heislerville WMA (eBird Checklist). Migrants noted at night in Atlantic City include COMMON YELLOWTHROATS, and a VIRGINIA RAIL. A WHITE-FACED IBIS was reported from Brigantine NWR. Shorebirds noted behind Harrah's included several flocks of BLACK-BELLIED PLOVER, 100+ RED KNOT, and an adult AMERICAN GOLDEN PLOVER. 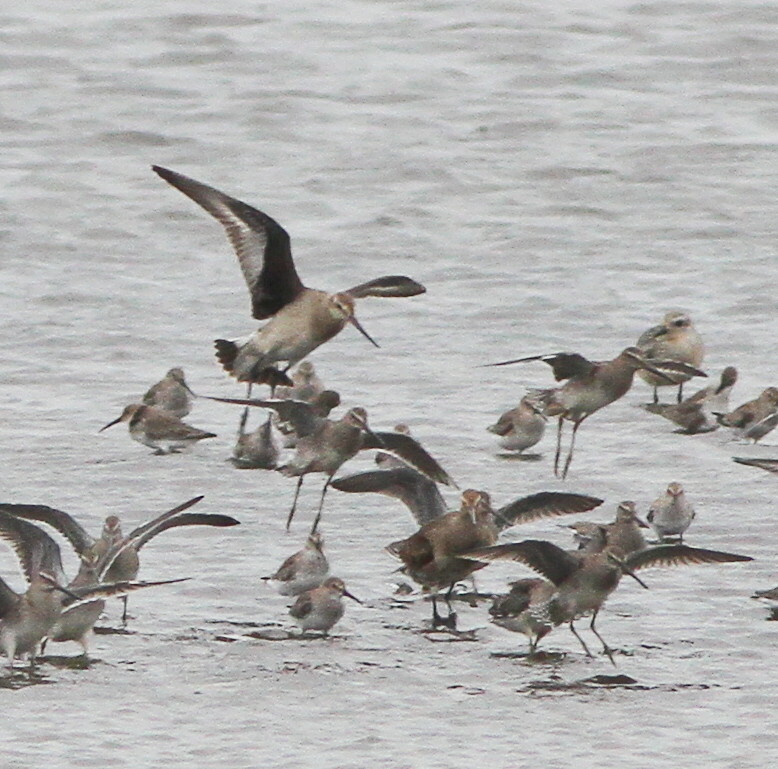 Brigantine Island had 42 MARBLED GODWITS, 180+ "WESTERN" WILLETS, one LONG-BILLED DOWITCHER, and 400+ BLACK SKIMMER. The Cape May Birding Hotline is a service of the New Jersey Audubon's Cape May Bird Observatory and details sightings from Cape May, Cumberland and Atlantic Counties. Updates are made weekly. Please report sightings of rare or unusual birds to CMBO at 609-884-2736. Sponsorship for this hotline comes from the support of CMBO members and business members, and should you not be a member, we cordially invite you to join. Individual membership is $39 per year; $49 for families. You can call either center to become a member or visit. Become a member in person and you'll receive a FREE gift (in addition to member discounts in the stores). Warblers grounded and a few seabirds.. Damp and gray weather looks set to continue for a while as south-west winds are forecast to predominate for at least the next five days. Though such a forecast isn't ideal if you're in Cape May to enjoy being outdoors, there should still be birds out there to be found. Grounded parties of warblers will be feeding up in sheltered corners, as I witnessed briefly this afternoon when I had an excuse to nip out to the Hawkwatch Platform with a journalist from Philadelphia. Amongst a busy feeding party of Yellow-rumped Warblers lurked Nashville, Palm and Prairie Warblers, Northern Parula and Common Yellowthroat, while the two Eurasian Wigeon were on Bunker Pond along with a nice array of other ducks. Higbee's Beach was pretty quiet on our walk this morning and the sparrows that descended on us a few days ago seem mostly to have moved on, but there's still a few Swamp, Song and White-throated Sparrows around and Yellow-bellied Sapsuckers are still present amongst the more numerous Northern Flickers. Elsewhere, Mike Fritz noted a late Mourning Warbler from his yard in Seaville, as well as an Orange-crowned Warbler, Sam Galick reported three American White Pelicans flying north from Cape Henlopen and 37 Parasitic Jaegers were counted passing the Seawatch at Avalon - a new single-day coun record for the species for the CMBO Seawatch. Dull and dreary makes for great birding! The first hour of the day was a washout, but the breezy gray skies that followed the rain made for some very nice birding in Cape May Point. Seawatching was excellent with at least four Parasitic Jaegers chasing terns and gulls offshore as gannets, scoters, and a Red-breasted Merganser passed by. The cedars next to the hawkwatch in Cape May Point State Park were buzzing with warblers - over 100, mostly Yellow-rumped Warblers, exploded from this grove when a Cooper's Hawk dropped in too close. Further investigation revealed a surprising 13 species of warblers in about half an hour, included the first Orange-crowned Warbler I've encountered this fall. Orange-crowned Warblers are usually pretty scarce in Cape May. Since this was the first I've seen or heard about this fall, I checked out eBird to see if others had been reported in the county. I found out that one was seen somewhere on Cape Island on 10 October and another at the Beanery on 9 October (check out the interactive eBird map here). Pine Warblers continue to be found around Cape May Point on a daily basis. Moving over to Lighthouse Pond, the continuing Eurasian Wigeon has been joined by a second individual, and a Nelson's Sparrow was in with the many Swamp Sparrows along the boardwalk. I heard that Dave Hedeen turned up a Seaside Sparrow (uncommon to rare in migration away from saltmarsh) nearby at Lily Lake as well. This group of American Wigeon is checking out their rusty relative - the bird on the right is a Eurasian Wigeon, one of at least two currently in Cape May Point. 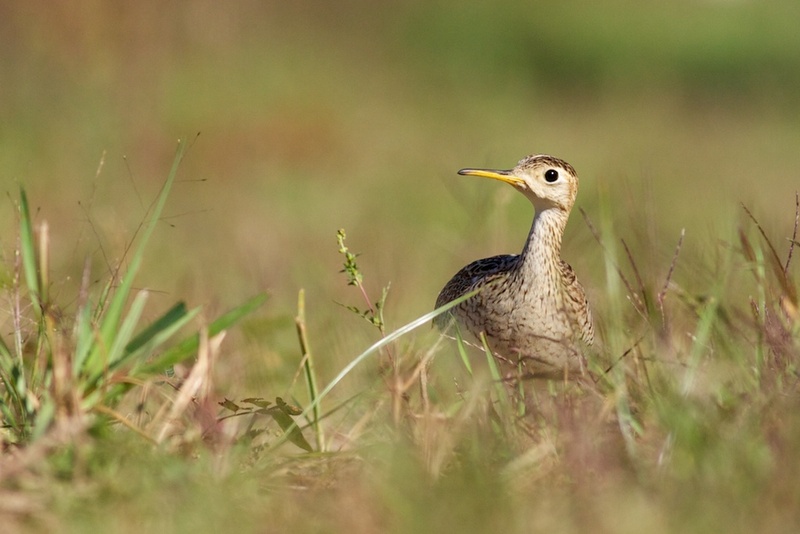 On 6 October, Nick Bonomo found a ridiculously tame Upland Sandpiper in the third field at Higbee Beach. This is likely the same bird that had been in the first field a week before. This time, however, the bird dashed around out on the path and even walked right up to me while hunting crickets on the ground. In the background of the photo above, you can see the legs of several birders who were being entertained by the sandpiper's antics. 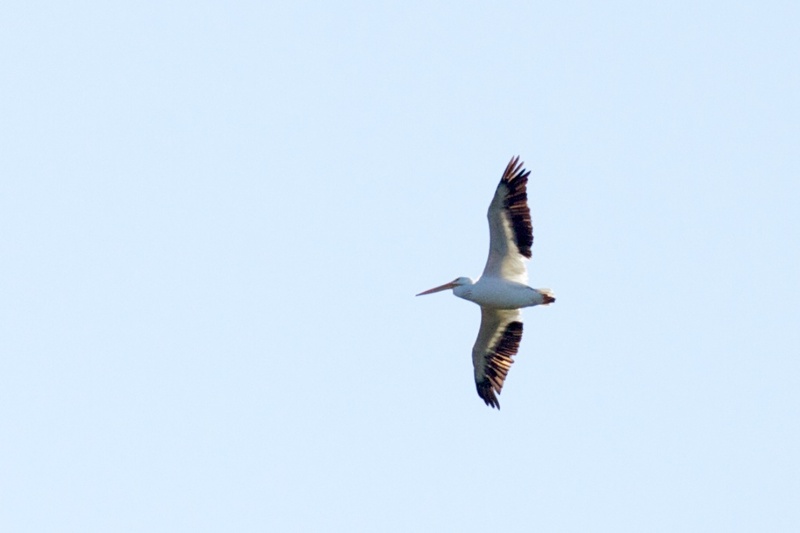 Liza Gray spotted this American White Pelican flying past Cape May Point State Park on the evening of 6 October; it stuck around overnight, and soared around over Higbee Beach for about an hour on the morning of 7 October before it disappeared. While it was circling over the forest, the bird was simultaneously in view at both the hawkwatch and the Higbee Dike (~2.2 miles apart). In addition to loads of Northern Flickers, Red-bellied Woodpeckers have been moving in numbers as of late. While these birds are typically thought of as sedentary, it is pretty typical to note small movements of 5-20 birds in a single morning at Higbee Beach in October. Clearly they show at least some migratory tendencies. Blackpoll Warblers are still making a big push through Cape May, even though Yellow-rumped Warblers are dominating the warbler show numerically. This bird is likely an adult with vestiges of alternate plumage remaining on its head. The cedars next to the hawkwatch platform at Cape May Point State Park have been reliable for hosting Blackpolls for several days now. Cape May in October... oh yes, there are raptors here. LOTS of raptors. Sharp-shinned Hawks, like this adult, have been pushing through in fine style. Diversity of raptors is high, and the first Golden Eagle of the fall was tallied yesterday (10 October) at the Point. Sunday October 9th saw the annual Big Sit take place at the Cape May Point Hawkwatch Platform. This is a national event organized by others, as I am sure that no-one at Cape May would organize such an event on Columbus Day!!! A day when the state park closed its gates to traffic because Cape May Point was simply, well, full!! Indeed, I hear that police were turning traffic away from the edge of town - the whole of Cape May was full! "As Sunday's de facto list keeper, I am today's de facto list sender. Tom Reed, we hope you'll return next year! Below is the list of 117 species tallied from the Hawkwatch Platform at Cape May Point State Park during yesterday's Big Sit. Nocturnal hours were cool and mosquitoey. Diurnal hours were quite warm. Conditions were cloudless until dusk. Even then the clouds were few, high and thin. Wind was calm to light, west to northwest. MVP Award goes to Steve Bauer for his on-site preparation of a hot, delicious breakfast at dawn. Bird of the Day Award goes to Hawk Counter Melissa Roach who spotted two Eurasian Collared Doves over Cape May Point. Kudos goes to Vince Elia for reaching his goal yesterday of ticking 175 species during his staycation...and for his compelling story about, well, you had to be there!! Whilst text reports around Cape May have been slim this season, at the moment they are non-existent as good old Verizon (which most of us have the misfortune of being on!) doesn't seem to be capable of dealing with texts at all (other companies seem to be doing OK). Belatedly, I heard of a Eurasian Wigeon on Bunker Pond and at least two sightings of a Golden Eagle over the point yesterday. David La Puma has kept me informed of large Yellow-rumped Warbler flights taking place both Monday and this morning and I can personally report a yardful of birds at home as our large Siberian Elm threatens to break under the weight of birds in it!! Yesterday afternoon we enjoyed Cape May, Black-throated Blue, Blackpoll and Yellow-rumped Warblers, Northern Parula, Brown Creeper, Ruby-crowned and Golden-crowned Kinglets and Purple Finch all in the one tree. This morning before work, I was able to add White-throated, Chipping and Savannah Sparrow, Blackburnian, Palm and Chestnut-sided Warblers, Yellow-bellied Sapsucker, Northern Flicker and Downy and Red-bellied Woodpeckers to the elm list - with a Hairy Woodpecker in the Silver Maple!! In addition, our first-of-season Dark-eyed Junco and White-crowned Sparrow were in the meadow along with plenty of Swamp Sparrows. In another one of those famous Cape May "You never know what might happen next" moments, Tom Johnson texted the news that an American White Pelican was passing west over Cape May Point (spotted by Liza Gray). I snatched a quick moment from the office and managed to see its back end disappearing towards the bay - a tick for my Northwood Center list! Even more unexpectedly, a few minutes later, Tom texted that the bird was heading back west towards the Hawkwatch and it was then shortly reported heading north over West Cape May by Tom Reed. The saga continued this morning, as what was presumably the same bird appeared heading southward over Higbee Dike and proceeded to spend at least half an hour soaring over the west side of the peninsula in the Higbee's Beach WMA area. Though the Upland Sandpiper showed well at Higbee's yesterday afternoon, it was not found this morning as far as I know - but maybe it will pop up again this weekend. This bird has proven to be very approachable, but please respect the bird and remember that Higbee's can attract large numbers of people, so give it space if there are more folks around. I would also please urge anyone to ask people yet again not to trample all over the Rye crop that has been sown in the first field at Higbee's. Despite my request, many people continue to walk all over it, even after having been asked nicely not to. Higbee's was pretty busy this morning with Golden-crowned and Ruby-crowned Kinglets, Swamp, Song and White-throated Sparrows, Northern Flickers, Red-eyed Vireos, Northern Parulas and Blackpoll Warblers being the commonest species. A Yellow-billed Cuckoo was seen in the third field and Common Loons are now regularly passing overhead. At least three Nashville Warblers were at Higbee's this morning. Megan Crewe reported six Snow Geese south off Stone Harbor and the Seawatch at Avalon reported female Common Eider and male Redhead. A male Ring-necked Duck appeared at Lightouse Pond, the first of the fall as far as I have heard. The weather isn't set for a big fall of birds this weekend, but it should be settled enough for a continued southerly drift of birds, so there should be plenty to look out for! With the coming of sparrows, it feels like late fall and the sparrows have certainly started to arrive now. On my Hidden Valley walk this morning we had a nice bow wave moving ahead of us as numerous White-throated, Swamp and Song Sparrows flitted out of our way. Overhead, the skies provided great views of a raft of Northern Flickers, kettles of Broad-winged Hawks and - best of all - a total of 10 Eastern Meadowlarks that bustled their way over our heads. Eastern Phoebes are in town in good numbers this past few days too, while anyone interested in Monarchs will have delighted in the departure of these amazing insects from roosts this morning - Michael O'Brien reported counts of 550 per minute passing him at Coral Avenue (though I don't know for how many minutes!!). 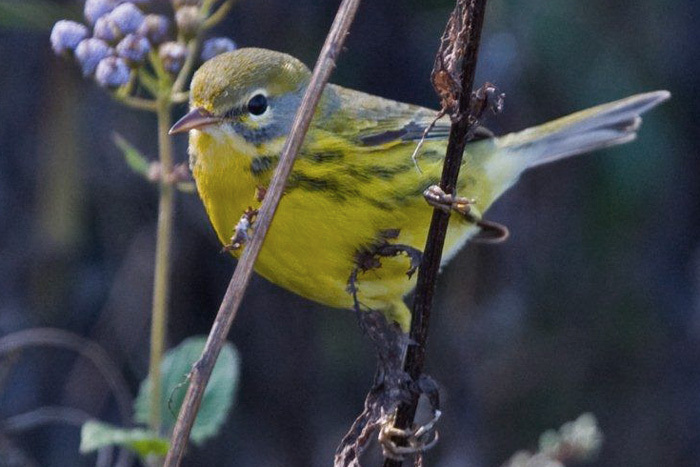 The odd Connecticut Warbler and Lincoln's Sparrow has been reported amongst the larger numbers of other species and a small run of Yellow-bellied Sapsuckers has proceeded daily since October 1st. Tuesday saw a Swainson's Hawk putting in a fairly brief appearance as it drifted past the Hawkwatch then was reported heading over the bay towards Delaware. On Wednesday morning, three Eurasian Collared Doves flying west along the duneline at the state park were intriguing. Are the birds from Cape May Point starting to wander a little now, or is this another three birds moving in? There's been no reports of any at the point for some time so it's hard to say what's happening with them. A possible Gray Kingbird flashed past the Hawkwatch on Wednesday morning and a Clay-colored Sparrow was reported from Del Haven in the afternoon. Perhaps the biggest surprise of this morning was the rediscovery of the Upland Sandpiper at Higbee's Beach today, now stationing itself in the third field. Since this is a particularly late date and since Higbee's is not generally considered a traditional spot for this species, it does seem likely that this is the same bird that was present there some days ago and which somehow has escaped detection. Warblers up close in the Point!